6 lenses per box @ $25.87 per box. Minimum order 2 boxes. Very thin and very comfortable, the Acuvue 2 has long been a favourite with first-time lens wearers due to the ease with which it is inserted and removed. A market leader since its introduction in 1999, it remains the most popular hydrogel lens in the world. 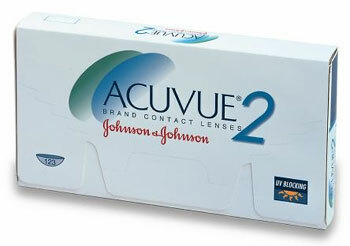 Very high UV protection as with all Acuvue contact lenses, plus a handling tint and inside-out marker.